Water Craft Plumbing and Gas is a small family owned and operated in North Canterbury­. -Removal of old hot water cylinder and removal from site. -LPG Station and change regulator installation. -Supply of Rheem 27 or Bosch 26C or DUX 26. -Commissions and Gas Certification included. -Most mixers are OK with the increase in pressure, extra charge for any altering mixers. -Electrical power point not included. 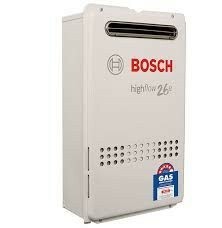 -Please Note: The Bosch 26C is a condensing unite and optional extra.